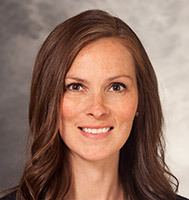 Dr. Wallace is an assistant professor in the Department of Obstetrics and Gynecology at the University of Wisconsin School of Medicine and Public Health, Madison WI. She specializes in treating patients with gynecologic cancer including ovarian, fallopian tube, primary peritoneal, endometrial, vulvar and cervical. She is a Congressional Ambassador for the Society of Gynecologic Oncology (SGO) and on the SGO Policy, Quality and Outcomes Taskforce. In addition to patient care, she is interested in healthcare delivery, healthcare policy and advocacy. Quality of life for her patients is very important and Dr. Wallace uses a team approach to care for her patients, their support team and family members. Dr. Wallace’s research focuses on quality and outcomes, quality of life and satisfaction and cancer prevention.